The spindle in the previous post is a simple Schacht spindle. It has a notch on the whorl. It is relatively lightweight but it has a long shaft. I spun with it last night with the bobbin on and it worked beautifully. The bobbin is a simple 4 inch Leclerc weaving bobbin, I am only using it for spinning. It costs 1.04 from the Woolery. I have not tried using the 6 inch bobbins. Some of my spindles have shafts with a circumference larger than that of the inside of the weaving bobbin. I am trying to come up with a solution for those. There are o rings that will fit them so all I need is a bobbin. 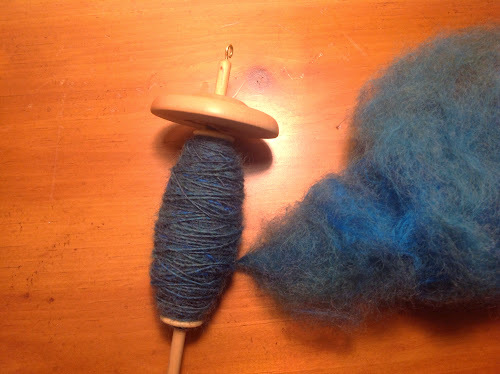 Here is the spindle and bobbin with about an ounce of fiber, it still spins well!